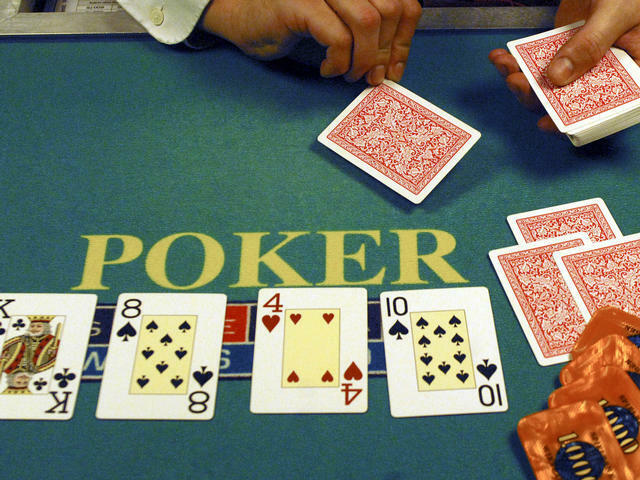 (CBS/AP) ALBUQUERQUE, N.M. - An Albuquerque man who asked to repay his investment scam victims with poker tournament winnings was instead sentenced to prison Wednesday, after he failed to get lucky at the card table. "This was long overdue," said J. Dee Dennis Jr., the superintendent of the New Mexico Regulation and Licensing Department. "This individual wanted to con us into believing that keeping him out of prison would help his victims get their money back. ... We're calling his bluff. It's about time we sent him to prison." Samuel McMaster Jr. stayed out of prison after prosecutors agreed to a request from his attorney to delay sentencing so that he could earn money to repay his victims. The former insurance agent was accused of stealing nearly $450,000 from 23 investors over several years. The way he chose to attempt earning money for restitution was through gambling, said Phyllis H. Bowman, lead prosecutor with the state Securities Division. Bowman said she was not aware of other attempts to make restitution by gambling, although she noted that others have tried to earn money through real estate speculating. As a result of McMaster's lack of luck at the poker table, Bowman said "the means by which somebody obtains restitution, even if it's legal and legitimate, will probably be questioned a little more closely." After he failed to pay, McMaster was sentenced Wednesday to 12 years in prison, five years of supervised probation after his release and ordered to make full restitution to his victims. He pleaded guilty last year to 26 felony charges, including securities fraud, sale of an unregistered security and sale of a security by an unlicensed broker-dealer. Bowman said McMaster got his clients to invest in promissory notes through his company, Santa Fe Financial Group Inc. The securities were not registered, he wasn't a licensed broker and the money was not used for investment purposes. Investors had been promised up to 10 percent interest, but Bowman said they never received anything, not even the return on their original investments.